Fun With Puzzles Brain Teasers Puzzles for Teens Riddles Riddles for Teens What am I Riddles Word Puzzles Riddle for Teens: Who am I? Riddle for Teens: Who am I? This Who am I? Riddle is for high school going teens. This Riddle will make you think out of box. However once you are able to find the answer of this riddle, you will feel that this was an easy riddle. This is one of the tasty fruit which gives lot of energy. Another meaning of this word can be found in calendar. Lets see if you can answer this fruit and solve this Who am I Riddle? Can you find it out Who am I? 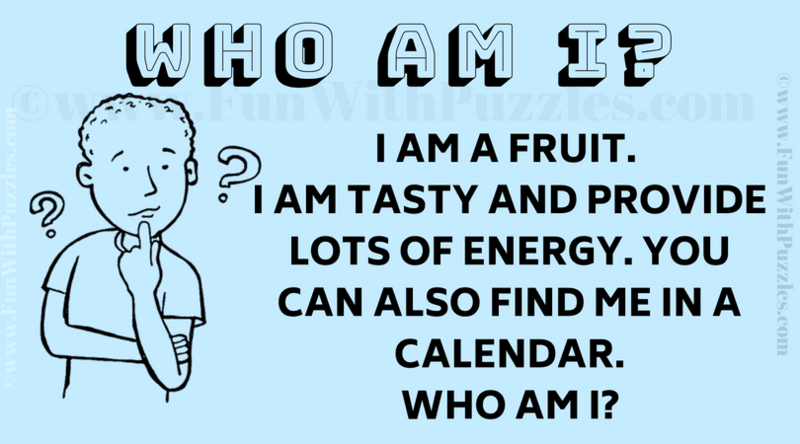 Answer of this "Riddle for Teens: Who am I? ", can be viewed by clicking on answer button. Please do give your best try before looking at the answer. Great! Your answer for this riddle is correct.